On November 26, 2014, the Ontario Liberals re-introduced the Ontario Immigration Act (Bill 49). The Bill is now in its Second Reading. Debate will recommence some time after the Members of Provincial Parliament (MPP) return to the Ontario legislature on February 17, 2014. This is an initial analysis of the Ontario Immigration Act. We will be releasing more information in mid-February. While this legislation is framed as an ‘Ontario Immigration Act’, it provides no real rights, benefits or access to immigration status for low-waged migrant workers in Ontario. It does not effectively free migrant workers from fees, or regulate unscrupulous recruiters. As it stands, the Ontario Immigration Act is designed to facilitate recruitment of high-waged migrants to Ontario in line with the new Federal Express Entry immigration system and develop provincial temporary immigration programs. Give Ontario the power to create its own temporary or permanent immigration programs, provided the Federal Government agrees to their creation. Give Ontario the power to create a registry of employers that hire within these new Ontario-determined programs. The registries are not compulsory. Give Ontario the power to create a registry of recruiters who refer migrants to employment in these Ontario-determined programs. This registry would not include immigration consultants who are often recruiters, and is not compulsory. Recruiters and representatives follow required protocols if and when they are registered. Allow Ontario to share information about employers and recruiters with other provincial and federal agencies, provided that registries are created. Give Ontario the power to fund non-governmental bodies to promote settlement and integration of immigrants. No actual funding is guaranteed. Give the Minister of Immigration and the Government the power to make subsequent changes Ontario’s immigration policy by regulation, and without having to table new laws. The Ontario Immigration Act does not legislate changes, it instead grants the government the power to implement reforms should it decide to do so. Moving key reforms into the realm of regulations, rather than legislation, further distances them from public scrutiny and influence. The Ontario Immigration Act is a missed opportunity for creating meaningful recruitment regulations in Ontario, and ignores best practices being developed in Manitoba, Saskatchewan and elsewhere. Require compulsory licensing of all recruiters working in Ontario with a financial bond: Recruiters charge migrant workers thousands of dollars, and seize documents from them to connect them with employers in Ontario. A robust licensing system, with a financial bond is necessary to end this practice. Require compulsory registration of all migrant worker employers in Ontario: Ontario depends on the federal government’s willingness to share information about employers that hire migrant workers. A compulsory and robust registration is system is necessary for accountability when fees are illegally charged from workers. Hold recruiters and employers jointly financially liable for violating labour protections: This practice is already the law in Manitoba and other provinces and ensures that responsibility for violations is not passed to recruiters abroad. Instead employers should be held accountable for working with appropriate recruiters (who should be licensed in Ontario) to ensure that migrant workers do not face abuse. Use employer and recruiter registries to uphold labour rights: Recruiter and employer registries should sit within the Ministry of Labour that has the expertise and the legal status to enforce employment standards, ensuring that migrant workers are not charged fees, and that their rates of pay and conditions of work meet Ontario’s minimum standards. The Ontario Immigration Act should also include access to Permanent Residency for low-wage workers. Ontario is one of the few provinces where the provincial immigration nominee program explicitly excludes low-waged workers. 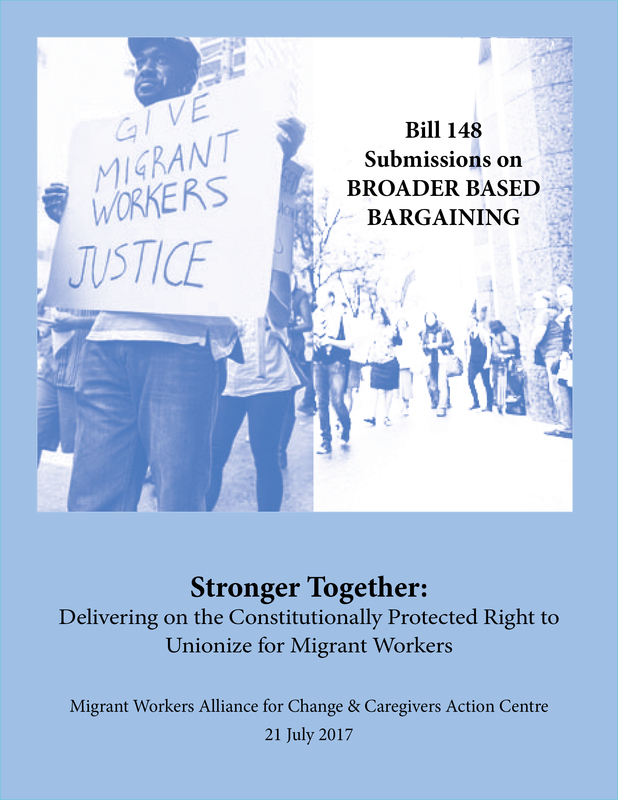 A fair Ontario Immigration Act would provide provincial access to permanent residency to workers of all skill levels, including low-wage, often deskilled & de-professionalized migrant workers. Prioritizes the right to immigration status on landing for migrant workers: Ontario should push for permanent immigration status for all migrant workers who build, feed, and care for Ontario. Ensure that migrant workers can access Ontario’s social safety net including access to social assistance. Update Ontario’s employments standard act so that it levels the playing field for precarious migrant workers. Expand tenant protections do that migrant workers are not relegated to sub standard housing and can live in housing of their choice. 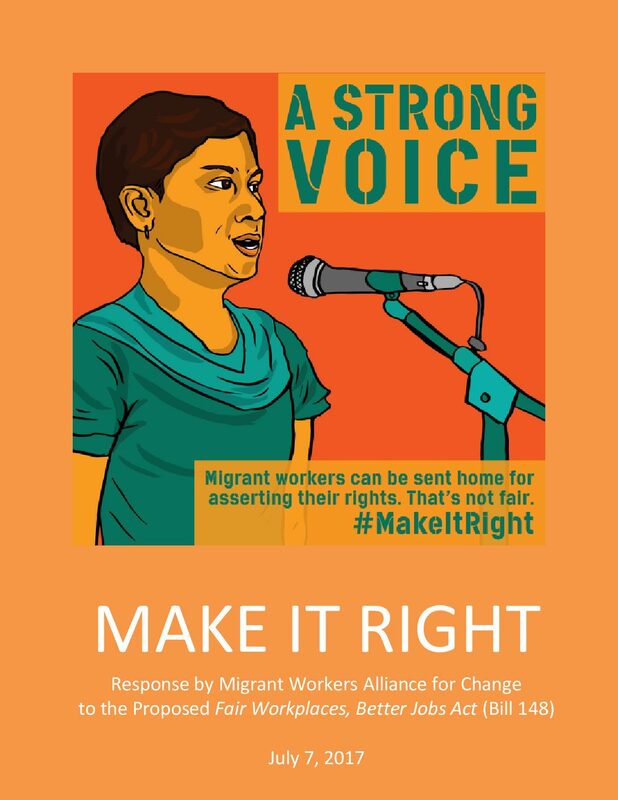 Changes need to be made to provincial and federal policy to ensure migrant workers in agriculture, care work, and other sectors gain meaningful rights and protections. To do this, we need you to get involved! 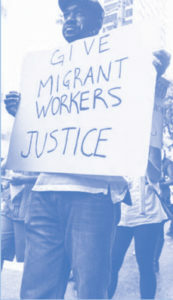 Get educated: Follow Migrant Workers Alliance for Change on email, facebook, and twitter. Get active: Reach out to member organizations of MWAC or other groups that work with migrant workers and volunteer your time with them. Help create the space for migrant workers to gather and determine their own political agenda. Pressure the politicians: Reach out to your your MPPs and your MPs and let them know that you are watching them.